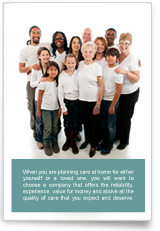 Creative Living Care Services - summary of our new service (starting shortly). When you are planning care at home for either yourself or a loved one, you will want to choose a company that offers the reliability, experience, value for money and above all the quality of care that you expect and deserve. When you’re having a stay in hospital, some extra support ready for you at home can be just what you need to leave hospital sooner and to ease the transition to being back at home. Our Home from Hospital service is designed to do just this. Creative Living is a care agency who provide and specialise in the supply of Homecare services to individuals in their own homes including 24 hour Live In Care. When you require flexible, high quality care as individual as you are, then choose our personal care and support service. Specialist Care is ideal when a person's care needs are exceptionally high, for example when they are bedridden or have serious health problems such as Acquired Brain Injury, Dementia, Neurological impairment or in need of Palliative Care. For those times when your regular carers are on holiday or are unable to provide your care, Creative Living can provide you with temporary care until your usual care can be returned. Personalisation is the vision for the future of adult social care and the emphasis is on individual choice and control over the care and support services they receive. © Waters Park Ltd. 2011 - all rights reserved.